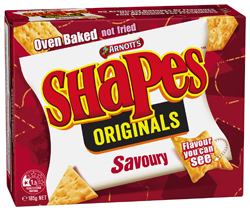 Over 53 million packets of Arnott’s Shapes are sold each year and have been popular and much loved since their release in the 1950’s. Shapes are baked not fried, contain no added preservatives, artificial colours or flavours and come foil wrapped for freshness. Arnott’s Shapes provide a healthier option than fried chips and are perfect for parties, sharing or a tasty snack. Savoury Shapes have a great flavour that you can see sprinkled on the cracker that will leave you craving more. These shapes are the bomb! In fact all shape flavours are wicked. Only problem is sanza are selling them when they are over a month out of date....cheeky gits! Note from SANZA: All stock past their best before dates are clearly displayed and discounted accordingly. We believe this policy keeps many shoppers happy!